Carousel for Theia Post Slider allows you to have thumbnails for your slides, adding a carousel for a richer user experience. 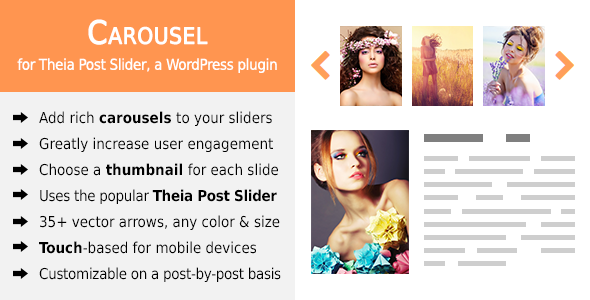 The plugin leverages the tried and tested Theia Post Slider for WordPress which transforms your posts into slideshows. It works out-of-the-box without editing your existing posts and is compatible with virtually any WordPress theme. Please note that this add-on plugin requires Theia Post Slider version 2.0.0 or newer. Adds rich carousels to your slideshows. Allows you to choose a custom thumbnail for each of your slides. Uses the popular Theia Post Slider. 35+ vector arrows you can choose from. Supports any colors and size. Supports touch-based events for mobile devices like tablets and phones. Can be customized on a post-by-post basis. High-quality code that adhere to the WordPress Coding Standards, complemented with comments where needed. Complete documentation for installing and customizing the plugin. Added support for Theia Post Slider v2. Fixed issues with disabling Carousel on specific posts. Added additional options for Vertical Positioning. Automatically disable if Theia Post Slider is not activated. Updated Owl Carousel to the latest version. Fixed an issue when the carousel could not be disabled.